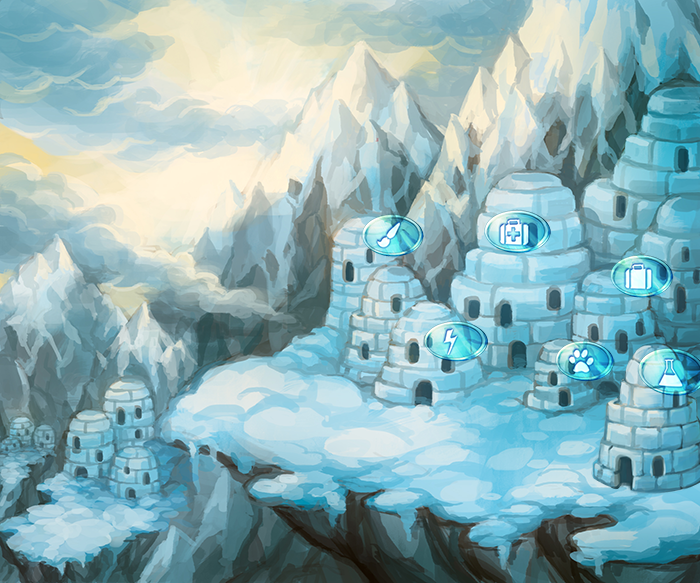 Each of FurVilla's five villages have a unique Town Hall, which displays links to the various shops located within that given village. 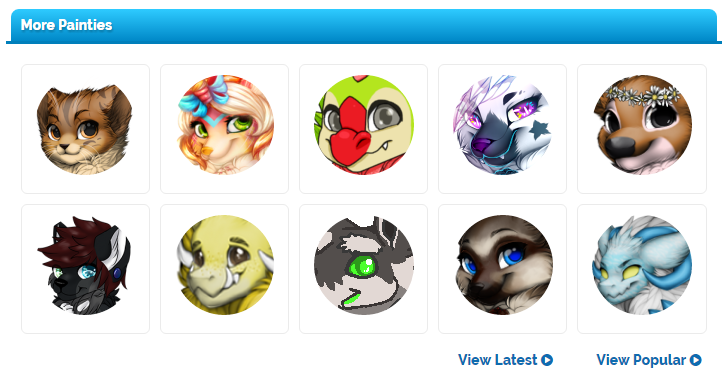 Below the image of town hall are three categories of links, which all lead to various areas of FurVilla. These three categories consist of Shops, Community, and Commerce; the shop links are the same links within the Town Hall image. Town Hall can be accessed in two main ways. 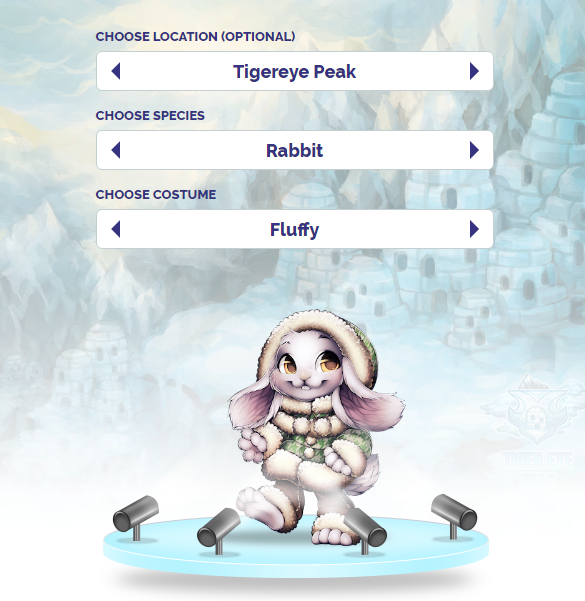 The first method that can be used to access the Town Hall page is to click on the Furvilla logo on the top left hand side of the main play screen. As indicated by the red arrow. The second method is by clicking the town hall link located on the navigation bar. As indicated by the blue arrow. Why use the Town Hall? The Town Hall is where all the shops are located. Town Shops provide you with the necessary blueprints and starting materials needed to pursue certain jobs. Town Hall can also be used to see Painties you may not normally view or to find villagers that need new homes. Each village has the same shops, but each shop has a different name and is run by its own NPC. The Crafter Shop is connected to the Paintbrush symbol in the Town Hall. This shop sells Blueprints and Sewing Kits, which are several of the items needed to be a Crafter. Blueprints and sewing kits are only purchasable through the Crafter Shop, they are not items that can be found. The lightning bolt symbol will link you to the Blacksmith Shop. To start the Warrior career you will need to purchase several of the shops basic swords and shields. Each village sells swords and shields of a different alignment. Light, Dark or Balanced. The Blacksmith shop also sells Schema, building supplies and Steel. Schema and Building supplies can only purchased in the Blacksmith shop and change from village to village, they are not items that can be found. Steel is a drop item in the Warrior and the Explorer jobs. To begin the Doctor job you will need to go to the Doctor's Shop, which can be found through the First Aid Kit symbol on the Town Hall page. The Doctor’s Shop sells Recipes and Containers. These items are only available through the village shop and are not items that can be found. Containers are also used in the Alchemist job. To begin the Alchemy job, a villager will need to purchase Potion Recipes from the Alchemy Shop. The Alchemy Shop can be located via the Flask image in the Town Hall. While containers are needed for the Alchemist job, they can only be purchased through the Doctor’s Shop. Potion Recipes can only be purchased through the village Alchemy Shop, they can not be found. The Tailor career involves the use of Crafted materials and the materials found within the Tailor Shop. To access the Tailor Shop click the Suitcase on the Town Hall page. The Tailor shop sells Pattern Books and Fabric. These items can only be purchased through the shop, they cannot be found. The Animal Husbandry Shop can be used to begin the Animal Husbandry job, and is accessible via the Paw Print on the Town Hall page. The shop provides the option of two animals which are different for each village. When an animal is purchased there is no choice in gender. These animals can also be found by a villager with an Animal Husbandry job. 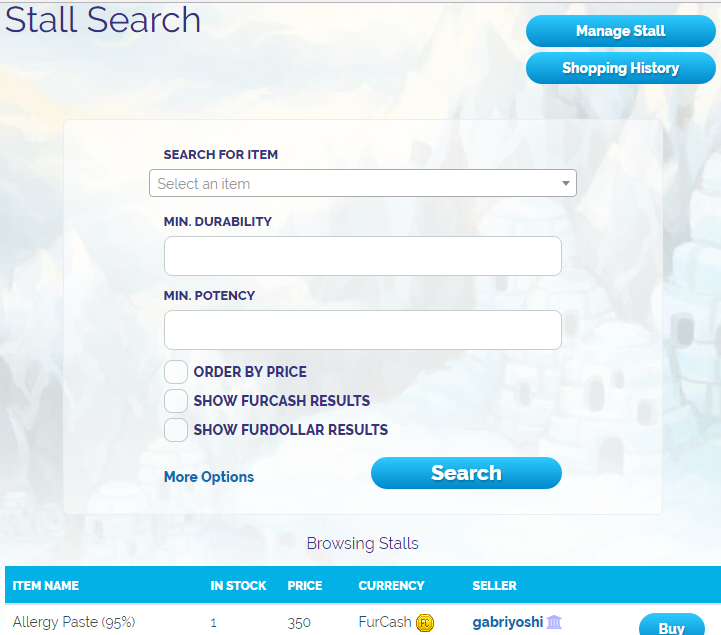 The FurDollar Emporium is the same for all villages and can be located via the Paper Dollar symbol on the Town Hall page. The only form of accepted currency in this shop is the premium currency of FurDollars. Morphing Potions, Animals and Vistas can be purchased here. These items are exclusive to the FurDollar Emporium. The icon containing silhouettes of people will grant access to the Village Forum. This is a forum exclusive to your village and can be used for a wide variety of activities. 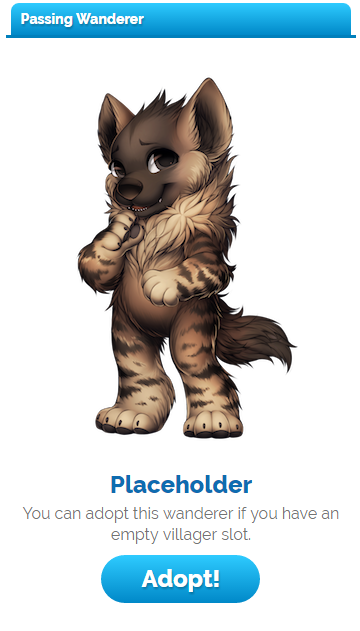 Trading, Conversations, Forum Games and Art Sales can all be done in the village specific forum. Other villages will be unable to see these postings. All forum rules are still in effect. The village chat feature allows for real-time conversations to take place between you and other members of your village. 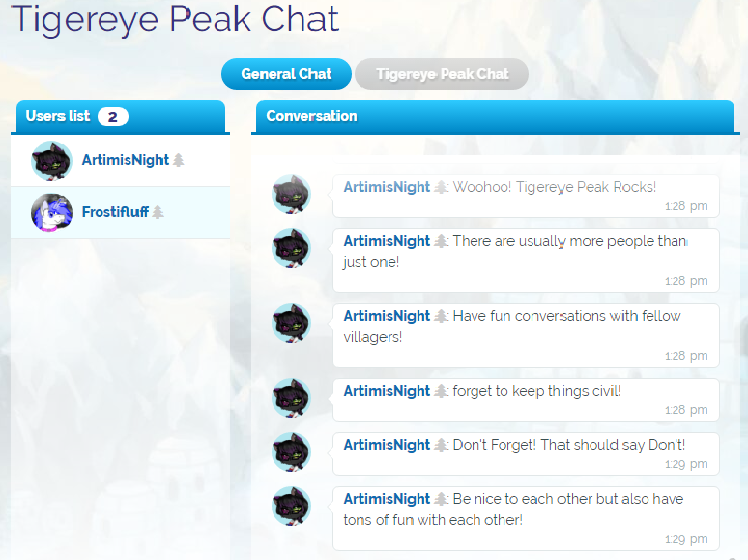 The list of active chat villagers is on the left of the screen, the conversation takes place on the right. The rules that apply in the forums also apply in chat. 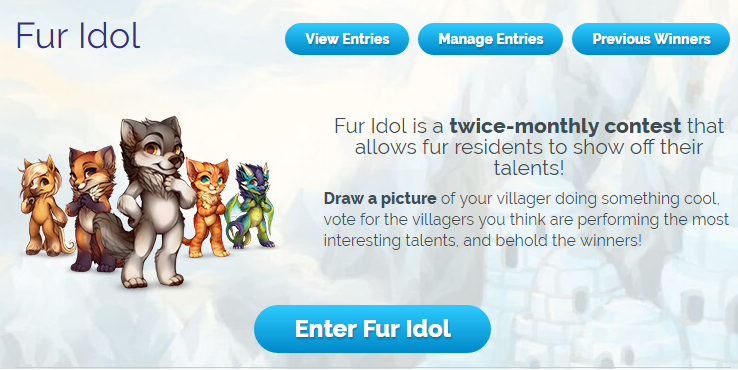 The Fur Idol Contest is an art contest for the players of FurVilla. Fur Idol Contests take place twice a month and the winners are the artists with the top three highest number of votes doe their submitted piece. 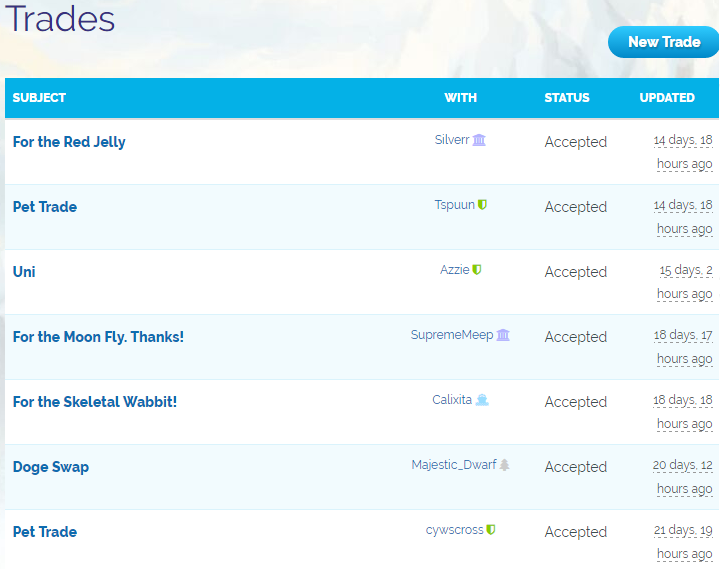 Each prize level receives different prizes and trophies for their user page. 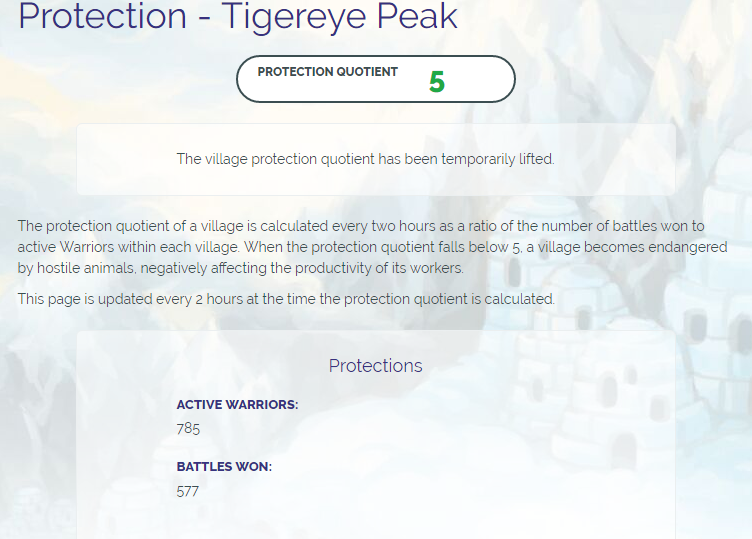 The Village Protection Quotient is the number of battles that must be fought within a two hour time frame. If the quota is not met within the given two hours then all careers will be delayed or effected in someway for the next two hour segment. 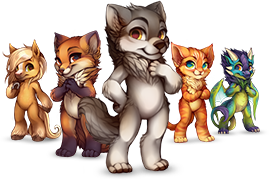 The Costume Museum is a feature that allows players to view the various costumes throughout the FurVilla universe. If no image appears while browsing through the costumes then there is no costume available for that villager at that time. The Costume Museum can be accessed through the first button on the Town Hall page that features the image of a building. The second button on the Town Hall page with a building on it will lead to the Item Museum. The Item Museum is a feature that allows a player to look up a particular item either by name, location, or type. 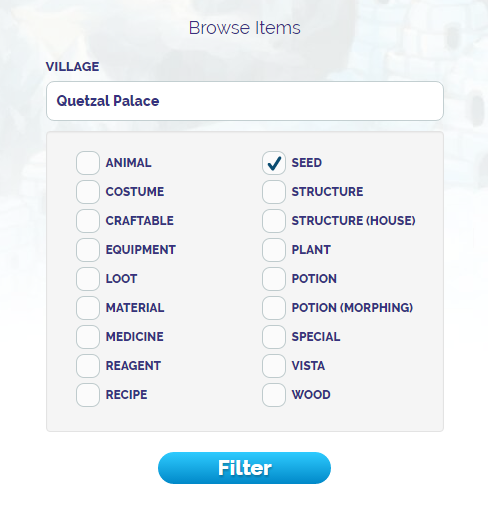 By selecting a particular village a player can see all the items available in that village. The search can be further refined by checking the boxes of interest below the search box. 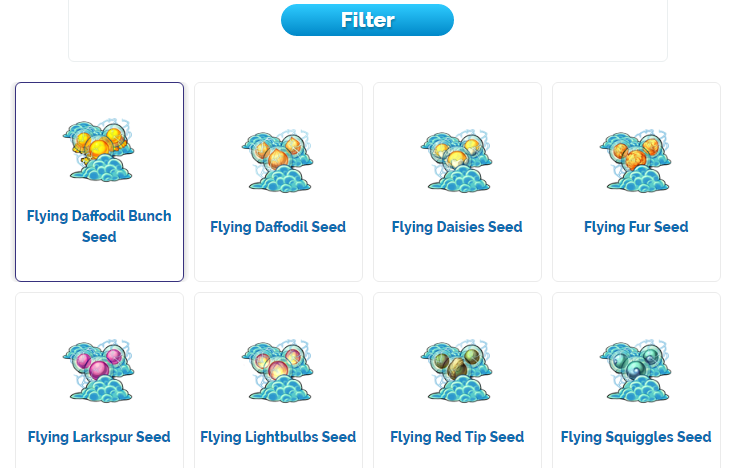 Items being searched for will appear beneath the Filter button on the same screen. 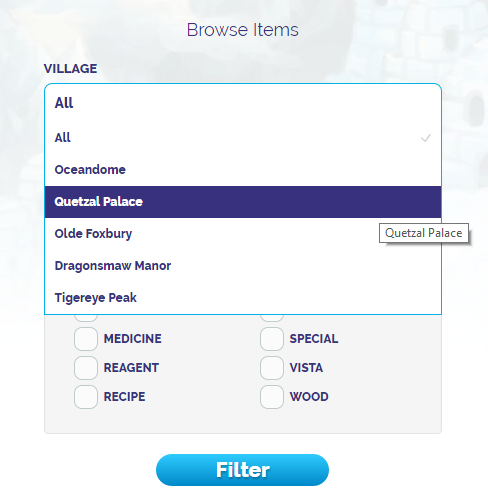 Clicking any of the items will take the player to the items page, where the player will be given the option of searching for the item in the User Stalls. User stalls are the shops created by each player to sell their items. A specific users shop can by observed by clicking on their name. When searching for a single item all of the user stalls selling that particular item will appear on the screen in order from least expensive to most expensive. The means of organizing search results can be done from the main user stall page which is accessed by clicking on the cart button on the Town Hall page. 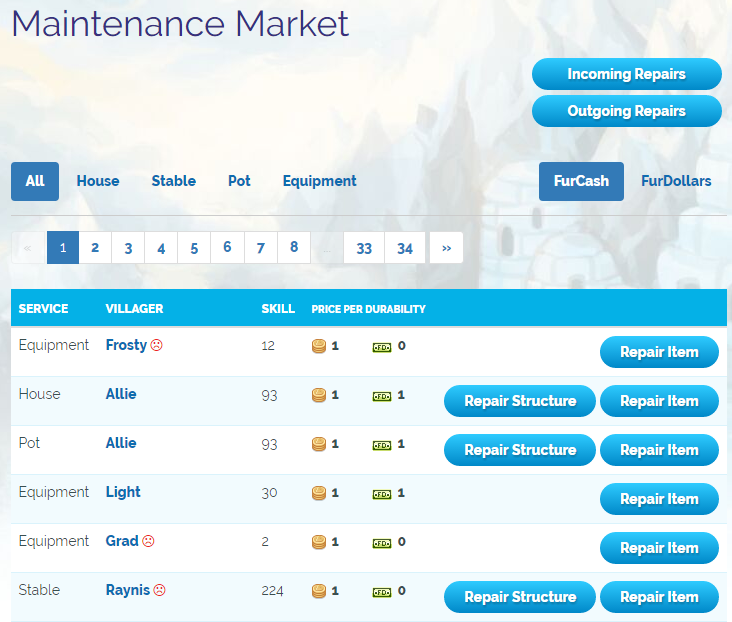 To access the Maintenance Market from the Town Hall page, click on the button with the image of a Wrench. The Maintenance Market allows players with villagers in the Blacksmith and Construction jobs to sell their skills and repair items for other players. Houses, Stables, Pots and Equipment repairs can all be purchased for a price. When a villager with a sad red smiley face by their name fixes an item it will take them twice as long to repair. When a villager is repairing an item for another player they will be unable to do other work until the repair is complete. 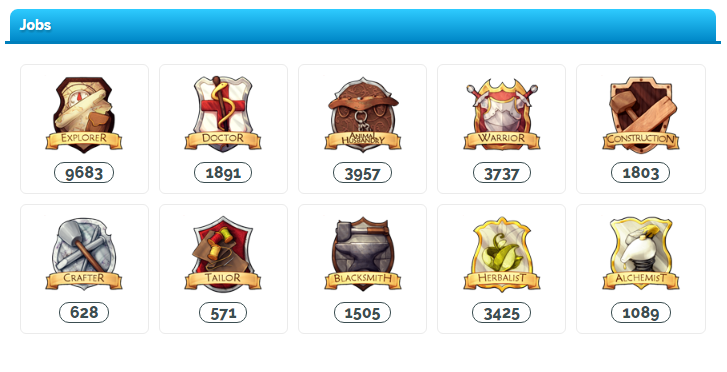 The final icon on the Town Hall page is a diamond. 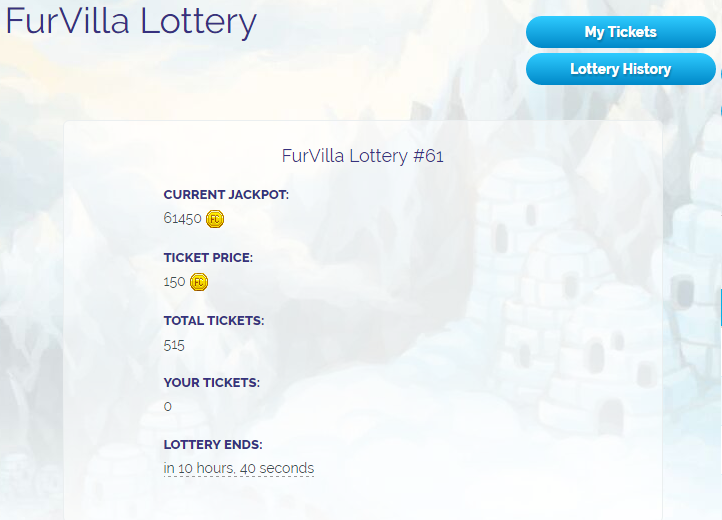 The diamond button will connect a player to the FurVilla Lottery page. Each lottery last 24 hours, The amount of winnable FurCash is dependent on the amount of tickets purchased. Each ticket costs 150 Fur Cash and can be purchased at any period throughout the day. Further down the page is a tally of all the Jobsheld by the villagers within a certain village. As the number of villagers within a village increases or decreases, so will the job tallies on the Town Hall page. The next feature of the Town Hall page is the Passing Wanderer. Displayed to the right of the Passing Wanderer is the Latest Paintie feature. What is the Latest Paintie?